"She'd told herself, and her husband Tom, that she was coming to rescue Vicky. And she was. She would. She'd been rescuing her sister her entire life. But she'd never done anything remotely this extreme. She knew the region had been evacuated, and yet somehow hadn't pictured everyone literally gone. . .The stark, devastated landscape heightened all her senses, as if her fear made the colors deeper, the smells headier, the sounds crisper. She couldn't give in to the terror; if she did, it might never end. She had no choice but to finish what she'd begun." A devastating earthquake has just hit the San Francisco Bay Area, cutting off the outside world completely. When Lily decides to fly from Nebraska to California and make the treacherous journey into the Bay Area to find her sister, she knows she's headed for a disaster zone, but nothing prepares her for what she finds. Those who survived and didn't evacuate are making shelters, running meals programs, rigging their own technologies--and redefining the very meaning of community. Lily bands together with a couple of feral kids, a steadfast activist, and a bonobo researcher, among others, to forge a new life. A piercing, unforgettable story of hope in the face of crisis, The Evolution of Love asks what does it take for people to come together, what dangers must they fend off in their bid for survival, and what lengths will they go to rebuild home. 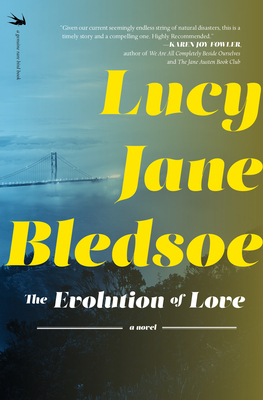 Lucy Jane Bledsoe is the author of five previous novels, including A Thin Bright Line. Her fiction has won a California Arts Council Fellowship in Literature, an American Library Association Stonewall Award, the Arts & Letters Fiction Prize, a Pushcart nomination, a Yaddo Fellowship, and two National Science Foundation Artists & Writers Fellowships. She's been a six-time Lambda Literary Award finalist and a two-time Ferro-Grumley Award Finalist. Bledsoe lives in the Bay Area where she spends as much time as possible kayaking in the bay, as well as hiking and cycling in the hills.